Several months ago, we featured an article on ductless heat pumps for the home. Due to the overwhelming popularity and attention that ductless heat pumps are garnering in the industry today, however, it is worth taking another look at this technology that can help a struggling environment and save homeowners big down the road. “Going green” and “environmentally-friendly” are terms that are tossed around a lot lately, but how much impact can one household have? Actually, a great deal, and the ductless heat pump is evidence of that. In our previous article on this subject, the “green” nature of the unit was only briefly mentioned and it certainly deserves more. HVAC is, by far, the biggest energy-consumer in your home, accounting for over 50% of your energy bill. Because of this, just the energy lost in the system and ductwork is the largest energy-waster there is, up to 20% of your power bill. Imagine then, a top of the line HVAC system which doesn’t have ducts for the energy to be lost, resulting in nearly 100% efficiency. The way a ductless heat pump works is quite ingenious: this “split system” has a unit outside which is connected to an indoor unit which mounts on your wall (as you can see from the photo above (top of photo), the indoor unit is sleek and attractive). Small tubes carrying heat and cold run from the outside to the indoor unit and, instead of the heat or cold being generated in an attic somewhere, it is generated right at the place you need it – no travel equals no waste. Even better, it is up to you where you want indoor units installed, the places where they are needed most. Instead of heating or cooling an entire house, each unit can be operated individually, concentrating the air only to where you need it. I don’t have to tell you how much energy that will save and how much the environment will benefit. 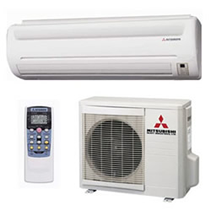 Due to their advanced technology, ductless heat pump installation is more expensive than regular HVAC systems. The cost increases with each additional indoor unit. On the flip-side, you will begin seeing savings right away. An energy bill reduced by as much as 20-30% will become the new normal for you. The larger price tag of a ductless heat pump will immediately start paying for itself, but it is up to you if this initial investment is worth the long-term benefits. Ask around, see if any of your friends or family have a ductless system and ask them if they are happy with their decision – my guess is that they likely are. Fingertip control. This is a big deal for some homeowners. Many people like that they can adjust the settings from a portable remote wherever they are in the home. Installation. Time is aspect to consider. The installation time of a regular HVAC system can be several days, while a ductless heat pump can usually be a one-day installation. Physical changes to your home. You can likely guess why a ductless heat pump takes far less time to install: there is far less work that needs to be done in the home. Traditional HVAC requires the installation of the indoor unit wherein changes might need to be made to the space, holes to be cut for vents if they don’t exist, the laying of ductwork throughout the home, and other physical accommodations. With a ductless heat pump, the biggest physical change to your home is the two small holes that must be routed through the walls to reach the wall units. There are no need for large HVAC vents because the wall unit is the vent. Whatever choice you make regarding an HVAC system, the best advice is to choose your service company wisely. If you live in Southwest Washington or Portland, Oregon, for example, Entek HVAC is one of the most respected names in the industry. Do your research and you will feel better knowing that you are putting your home in the right hands. Southwest Washington and the Portland area.